Over the last decade, 3D data collection technology has been rapidly evolving. 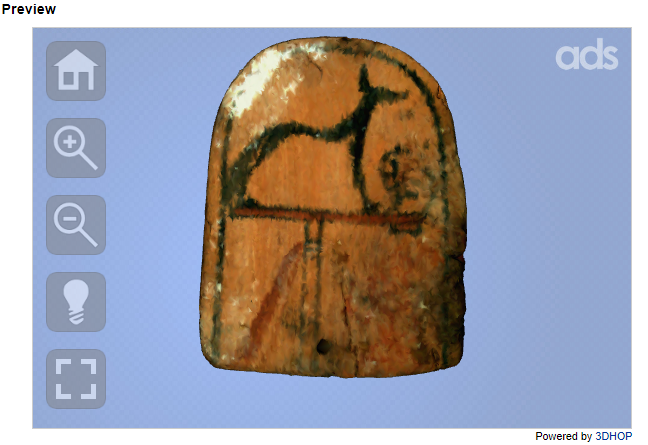 Various archaeological projects have been utilizing methods to provide a digital copy of their work and visualization. Researchers have used CAD to show variations of different stratigraphic layers in archaeological sites, photogrammetry to digitize their findings, and 3D models to show reconstruction of sites and artifacts. The ADS provides researchers with the means to preserve this data within an accredited repository and disseminate it via an open online database. By depositing data with the ADS, researchers are allowing their projects to be openly accessible to the public for the data to be reused by other researchers. With evolving technology, methods to record archaeological data have become more advanced over the last century. This includes using 3D technologies to record such data. The ADS is a resource for depositors to store their 3D data to be openly accessible for individuals and researchers to access for their own personal use. Investigate the use and re-use of archaeological 3D data found in the ADS through: web statistics and publication citation analysis, tracking disseminated 3D data, user survey, and a basic human-computer interaction evaluation of the ADS website. Provide a series of recommendations for the effective dissemination of 3D data to the ADS and interested 3D data creators and users. The results of my first two posts show that there has been little clear examples of re-use of archaeological 3D data. This does not necessarily declare users have not utilized such data for their research as they could be used for personal reasons or projects but data citations of archives are limited. Data access to the archives can be seen and often stays contestant at a low number, with waves of interest usually linked to an identifiable event, but there is limited knowledge able to be gained without data citations for what the downloads are then being used for. The user surveys results also failed to provide a wealth of exemplars of data re-use. And although The 3D hop interface used to view 3D data is seen as a positive addition there is little evidence from both the webs usage statistics or the user survey that it encourages or discourages data download. This has led to recommendations for the future development of the ADS archive and for researchers depositing data in a digital repository which will help them improve the impact of their research. Recommendation 1: The ADS should develop a new method for users interested in projects utilizing 3D data to navigate to these archives. This could be a beneficial addition to the website. The results of the questionnaire regarding 3D data usage shows an overall interest in viewing 3D data of various formats. Every participant found that it would be useful if there was a way to navigate easily to these archives. The majority of participants are more than likely to incorporate 3D data into their own work if they happen to find data within their own interest areas. The incorporation of a filter to navigate users through the ADS archives could provide more traffic to these archives. This in turn may encourage new, or returning, depositors to include 3D data in their archive. From analyzing several features to gain insight of the overall use of archives containing 3D data, it was found that user interaction with these pages could benefit from incorporating a tab within the main sidebar. Most users may not be actively searching for archives with 3D data but a tab would make the data more visible. 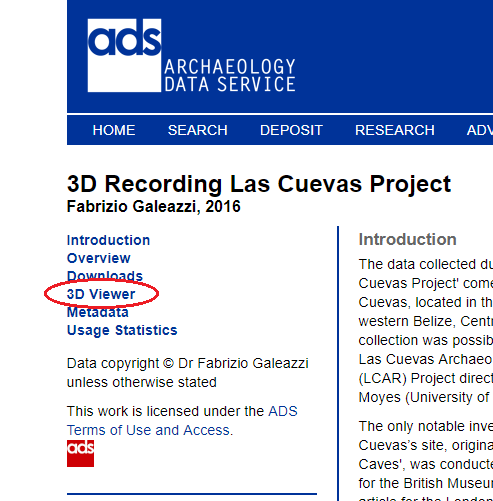 For example, within the archive for the 3D Recording Las Cuevas Project there is a sidebar tab for “3D Viewer” created for this project (Figure 1). It may be beneficial to incorporate this tab into additional archives utilizing this viewer. Figure 1. 3D Viewer sidebar tab. Recommendation 3: The name of the tab, 3D Viewer, can be changed to incorporate different forms of visualization for data utilizing the 3DHOP viewer. This can be seen in the Urubici Rock Art Project. The project contains an RTI Builder on the web page and is similar to the 3D Viewer as it has also been produced by CNR. 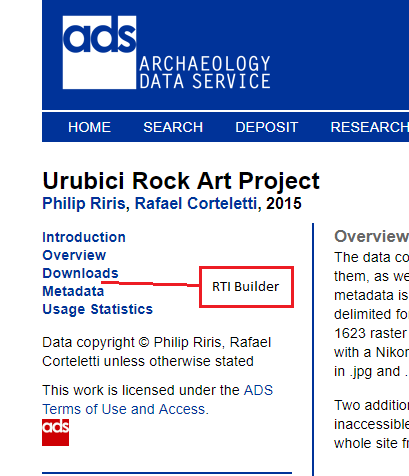 Incorporating a tab for the RTI Builder under “Downloads” would provide consistent placement for viewing the data (Figure 2). Figure 2. Placement for an RTI Builder tab. As explained in the post for the user survey, accessing 3D data is slightly difficult. The current filters grant users the ability to find all the archived projects relating to their research interest. However, the results of these filters are entirely reliant on the metadata provided by the depositor to the ADS at the time of deposit. By including a filter of some form to find 3D data on the main archives webpage, users would be able to navigate through every archive to find projects including 3D data. This can be seen by creating another filter under the “WHAT” query (Figure 3). 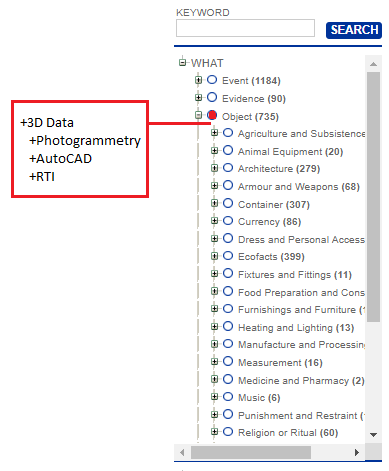 Another option which could be useful is placing the filter under the “Object” filter which would also include further filters showing the different types of 3D data available within the ADS archives (Figure 4). With the incorporation with easier methods to find and filter for 3D data, future studies examining the overall use and re-use of 3D data provided by the ADS archives can evaluate any differences between new and current research. Figure 3. 3D Data ‘WHAT’ filter example. Figure 4. 3D data ‘Object’ filter example. Recommendation 5: The ADS should introduce citation tracking metrics to there usages statistics pages. As seen in the post for web usage and citation tracking , the citation statistics vary for each archive. There are publications of the topics of the different archives, however, it does not specify if they received any data from the ADS. By including a method to track citations such as Dimensions, users can find additional publications utilizing the archive for other research. In the user survey twelve respondents indicated they had previously interacted, created and/or managed 3D data. There were two participants who were unaware of several factors of 3D data provided by the ADS as they responded ‘no’ to several answers. It would be interesting to see another questionnaire created involving different websites utilizing 3DHOP as their 3D viewer. By using similar questions of the usability and knowledge of 3D data existing for countless archaeological projects, there can be a larger scale insight of the use and re-use of archaeological 3D data found on various platforms. As stated in the investigation of web usage and citation tracking, depositors rarely reference their archived work residing at the ADS. This leads into a low impact for the archives being viewed and used within research from individuals. By creating the archive early, they can publish links to data in publications. The links can add volume to the popularity of their research and by including the DOI to the ADS archives, these projects can continue to advance while being subjected to additional research and use in different fields. I think it is important for 3D data in archives to become visible for a wider audience who may not know how to access such data. This will be improved if depositors archive their projects early in order to reference within their publications, which could allow for more web traffic to view their work. The creation for a new method for users interested in projects utilizing 3D data to navigate to these archives could be a beneficial addition to the ADS website. With the incorporation with easier methods to find and filter for 3D data, future studies examining the overall use and re-use of 3D data provided by the ADS archives can evaluate any differences between new and current research. Additionally, the recommendations listed above discuss methods which can be taken to create easier discoverability and querying through the ADS archives. By understanding these results and taking recommendations into consideration, there can be further research and use for the archived 3D data found within the ADS.